The elegant, aristocratic Saluki; also called the Persian Greyhound, Arabian Hound, Gazelle Hound, Saluqi, Tazi, El Hor (“The Noble One”) and The Royal Dog of Egypt; is one of the world's oldest domestic breeds. The ancestry and historical background of most domestic dogs usually can be traced with some degree of accuracy. Not so with the elusive Saluki, their origin pre-dates recorded history and some say that it dates back to a time before ancient Egypt, which was one of the earliest of all human civilizations. What is known is that Salukis have lived in the Middle East since antiquity, and that they have been treasured by nobility and prized by nomadic hunters for thousands of years. The name ‘Saluki’ probably comes from “Saluq,” a long-gone Arab town. They have a very exotic look about them - long, narrow heads with large eyes and drop ears, their tails are long and curved and they have the typical deep-chested, long legged body of the sighthounds. There are two coat types - smooth and feathered. The feathered variety has light feathering on the back of the legs and thighs. The fur on both types are silky to the touch and comes in a variety of colors, including white, cream, fawn, red, grizzle and tan, black and tan, and tricolor (white, black and tan). The overall appearance of the Saluki is one of grace and symmetry. These dogs may appear delicate, and to some even skinny, but this should not fool you into thinking that it is fragile. This is a powerful athlete with the strength and stamina to tirelessly cover uneven and dangerous terrain over great distances in pursuit of its pray. They are sighthounds (which means they hunt by sight) that were bred by nomadic tribesmen to chase down, restrain and kill rabbit, fox, deer and even the swift gazelle. 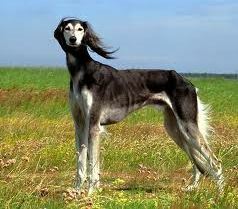 The Saluki was (and still is) prized for its keen eyesight, exceptional agility and remarkable speed. This breed loves spending time outdoors but they need to sleep indoors, they prefer warm temperature over cold. Salukis need lots of room to run, so apartment living is not ideal for them. They need a yard but be aware that they can jump over a 5' fence, and they are also skilled diggers who can dig under a fence. The #1 cause of death for a Saluki is being hit by a vehicle. The ideal human companions would be active singles or families, families with older children, hunters and sportsmen. They are not well suited for the elderly - they need an active lifestyle. These dogs were bred to hunt down pray in the dessert, they have the stamina to tirelessly cover uneven and dangerous terrain over great distances. For this reason they need a lot of exercise and a daily leash walk is not enough. They love to run more than anything else in the world, a wide-open, controlled, fenced off area is the ideal sprinting ground for them to romp around enjoying vigorous exercise. Keep in mind that these dogs can reach speeds of 55km/h, so you will not catch a Saluki if he gets away, and if they are in chase mode they are notoriously bad at recall. Thus it is very important to keep them on lead if you are not in a save secure area. They can be quite sensitive and typically don’t enjoy rough games or typical dog games such as chasing sticks. An excellent way to exercise them if you cannot get to open areas where they can run off lead is to let them jog/run alongside your bike. Other ways to exercise them both physically as well as mentally is to participate in activities such as lure coursing, agility, flyball, jumping, racing, and tracking. These dogs form a special bond with their owners, and they love their families dearly, but they are not likely to go bonkers when you walk through the door. They do however make good watchdogs but are by no means guard dogs. If they are lonely or stressed, they may howl and bay, but in general, the breed does not bark unnecessarily. Socialization and training from a young age is recommended to prevent timidity and shyness in later life. They should also be kept busy as they can get bored easily, especially if they are left at home unattended for long periods. They can be mischievous and will become destructive if lonely. Only from reputable breeders! One can contact the Kennel Union Of South Africa (KUSA) . They have a list of breeders who have puppies available. Which other breeds are most compatible with the Saluki? These dogs will pretty much get along with most other dogs as long as they have been socialized properly from a young age. Breeds such as Pitbulls and Staffies won’t be good choices as they can be a bit dominating and, with the Salukis sensitive nature, can cause problems. Good companions for them will be naturally another Saluki, Greyhound, Whippet, Setters, Pointers, etc. Active dogs will make great companions. Salukis are good-natured and usually enjoy the company of other dogs. They can also do well with cats - especially if they grow up with them, but they may chase strange cats. However, given their hunting instincts, they are prone to chase and kill non-canine animals so you need to take great caution around pets such as birds, guinea pigs, hamsters and rabbits. They are excellent with children, especially if raised around them and if the children do not try and roughhouse them. However , like with most dogs, it is recommended not to leave toddlers or young children unattended with these dogs. They are usually aloof with strangers, but in general they are peaceful with everyone. These dogs are very intelligent but can be quite independent as well, so they are definitely trainable but it takes a bit more effort. They don’t take kindly to harsh discipline and must be trained with calm, gentle, but firm, consistency - never using force or harsh methods. They are fairly submissive by nature to people but are easily distracted. The Saluki can be taught obedience but it will require patience and consistency. Even a well-trained Saluki is not terribly obedient. Still, they excel at lure coursing, agility, flyball, jumping, racing, and tracking. They also make great therapy dogs and greatly enjoy having a job to do. Despite having a medium-length coat they are fairly easy to groom. They only require an occasional brushing, but because they sheds you may find yourself brushing them once or twice a week to remove loose hair. In general this breed does not have a lot of health issues and tend to live long healthy lives. Some of the common health issues they can have include hip dysplasia, eye problems, cancer, hypothyroidism and cardiac problems. They are also prone to sunburn especially on the nose. While the Greyhound is credited as being the fastest dog breed up to distances of around 800 meters, both the Saluki and Whippet breeds are thought to be faster over longer distances. The 1996 edition of the Guinness Book of Records lists a Saluki as being the fastest dog, reaching a speed of 68.8 kilometers per hour.